The country has benefited from listing sites, but it must avoid politicizing the process. Japan loves lists, whether they are domestic, such as the country’s three famous views (Nihon Sankei), or its 100 famous mountains (Nihon Hyakumeizan); or international, such as Japan’s strong showing on the Michelin-starred restaurants list. However, no list is as admired as much as UNESCO’s list of World Heritage Sites. Japan has successfully nominated 15 UNESCO cultural sites and four natural sites since UNESCO began inscribing places, buildings, and objects in 1978. Japanese have celebrated the inscription of Japanese and international cultural and natural properties with popular TV programs (NHK Sekaiisan and TBS’ The Sekaiisan), and by showing up in droves to newly listed sites in Japan and abroad. Historically, Japan has also been a major financial supporter of UNESCO, providing the second largest amount of funding after the United States. Additions of new UNESCO sites have been met with much fanfare, often dramatically increasing the number of tourists visiting the sites. For example, since gaining World Heritage status, the number of annual climbers ascending Mount Fuji has increased significantly. The economic boost provided by World Heritage inscription led in part the push to certify Hiraizumi in the aftermath of the 3.11 disaster, providing the Tohoku region with its first World Heritage Site – in the interests of providing a needed economic stimulus. Recently, however, the Japanese government’s enthusiasm for UNESCO has waned as China successfully nominated documents pertaining to the Nanking Massacre to UNESCO’s Memory of the World Register. The Nanking Massacre is the source of much disagreement between Japan and China, and China’s effort to the documents nominated is perceived to be a shot at Japan. Japan too, has recently faced criticism for its listing of Meiji Period industrial sites under the cultural heritage category. Korea demanded that Japan recognize the use of forced laborers (from the Korean Peninsula) at the sites before it would support the listing. In 2013, Korea successfully inscribed kimchi on UNESCO’s Intangible Cultural Heritage of Humanity list. While Abe Akie, wife of Prime Minister Abe Shinzo, celebrated the listing of kimchi at an event in Tokyo, the listing marked a decisive victory for Korea over a long-standing dispute between Korean and Japanese kimchi makers. Previously, Korea had successfully lobbied to change the World Health Organization and Food and Agriculture Organization codex for kimchi to exclude unfermented variants (often produced in Japan). Obtaining UNESCO listing further legitimized Korea’s claim that Japanese unfermented versions of the dish are not real kimchi. Japan has experimented with the politicization of listings, nominating documents pertaining to the use of forced labor of 450,000 captured Japanese in the USSR (mostly in Siberia) after Japan’s surrender in 1945. Russia has responded, warning Japan not to open a “Pandora’s box” by politicizing UNESCO listings. Japan should heed the warning, as it could be opening itself up to subsequent unfavorable politicized nominations. It could also struggle with forthcoming nominations as its bids are resisted by nations unfriendly to Japan. Complications related to nominating new sites could be an enormous opportunity cost. UNESCO-listed cultural and natural sites provide economic benefits to the regions hosting them. Even if the increase in tourists is temporary, it provides a much needed stimulus to many moribund regional economies outside of major urban centers. This factor may be more relevant than ever as Japan experiences an unprecedented tourism boom, with the potential to bring in 20 million foreign visitors by 2020. As other sectors in the Japanese economy falter, its tourism sector is surging. While most of the recent tourism growth has so far been centered on Tokyo, and to a lesser extent Osaka, the Japanese government has expressed interest in promoting regional tourism based on Japan’s World Heritage Sites distributed throughout the country. By defunding UNESCO, Japan could lose its right to vote on future sites, limiting the listing of unrepresented and underrepresented regions, such as Shikoku and Hokkaido. Japan is otherwise in a good position to obtain more World Heritage Sites, but it is a position that will diminish in time. Japan is currently one of twenty one members of UNESCO’s World Cultural Committee. Members of this committee are in a privileged position, being more likely to have successful nominations than non-members. UNESCO applications are also overwhelmingly submitted by wealthy countries, giving them a large share of the total number of sites worldwide. As Japan’s economy shrinks relative to emerging economies, it will face more competition from increasingly affluent applicants, even if the total number of applications continues to decline. Since 2005, a state can only nominate one cultural heritage site and one natural heritage site per year, with a maximum of 45 sites approved globally. Japan needs to walk a fine line as it responds to efforts to politicize UNESCO’s work. The country can benefit by continuing to nominate its sites, but it will lose out if it chooses to sit out of the voting process. Striking a balance between its political interests in defending its image overseas, deterring future efforts by nations using the body to attack Japan, and ensuring that it can continue to develop new centers of growth around UNESCO World Heritage Sites will be crucial. Trevor Kennedy is a Master of Arts Asia Pacific Policy Studies candidate at the University of British Columbia. Mt. 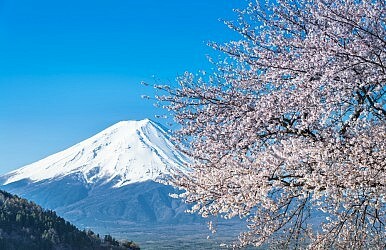 Fuji, Japan’s most iconic peak, will likely become the nation’s 17th UNESCO World Heritage site. Japan's Tangle of Ideology and DiplomacyJapanese Company Apologizes for Forced Labor During World War IIPotala Palace: Tibet’s Towering Spiritual SanctumUS-Japan Trade Agreement Negotiations: Why Now?Is Japan Anti-China?